Design your custom planner today! 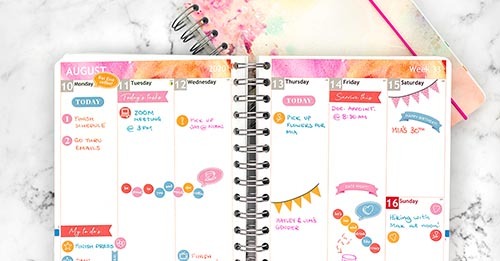 Create a personalised planner, with your own structure and style. Customize your Personal Planner to suit your needs, and to match your style. Start by selecting size and starting month, then design the front and back covers as you like. You can upload your own pictures, or choose among our many wonderful designs. This is where you select the design and layout of your inlay. There’s horizontal and vertical weekly layouts, lots of beautiful header options, and different color combinations you can try. 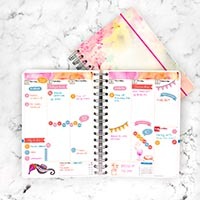 Add your own personal dates so they come preprinted in your planner, and perhaps a couple of clever modules for to-do lists, trainings, menu plans etc. Lastly, choose between a ton of fun and functional pages to add at the end: ruled pages for note-taking, year overviews to plan the future, maps for dreaming up your next get-away, and coloring pages to unleash your inner artist. Pick and mix as you like! This section has 18 or 48 pages, depending on the size of your planner. Blank, ruled, squared, dotted pages, and more! Your life, on your terms. We help you create a planner that combines your need for style and for structure, perfectly. Using only the best materials and printing methods, we produce your planner entirely in Sweden. Guaranteed to do good for everyone involved. And the environment, of course! We ship your planner hot off the press all the way to your door, for free, wherever in the world that may be. 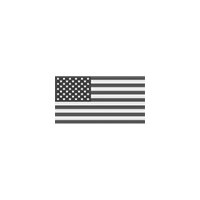 Yup, that’s free worldwide shipping!